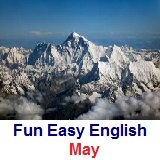 ﻿ Fun Easy English - new classroom free online classes english language lessons speaking listening writing reading may. Temperatures continue to get warmer....um at least in the northern hemisphere of the planet. lol. 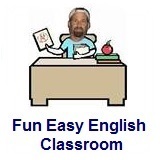 A nice time to go outside and bring the Fun Easy English classroom along with you. This month in the classroom grammar focuses mainly on articles and verbs. Pronunciation lessons include the last few vowels sounds. And of course you will be learning some new slang, idioms, and reductions. May 4 Grammar: ditransitive verbs What’s for Dinner? May 27 - Memorial Day - Test your reading comprehension about Memorial Day.